A whale was captured on video back in February with just her tail hanging out of the ocean, while her calf swam around her. The humpback whale, which scientists spotted off the coast of the Hawaiian Island of Maui, was exhibiting some pretty rare behavior for the species. NOAA reports "tail-sailing is fairly common among southern right whales but has rarely been observed or documented among humpbacks." It's even more uncommon to capture it on film. 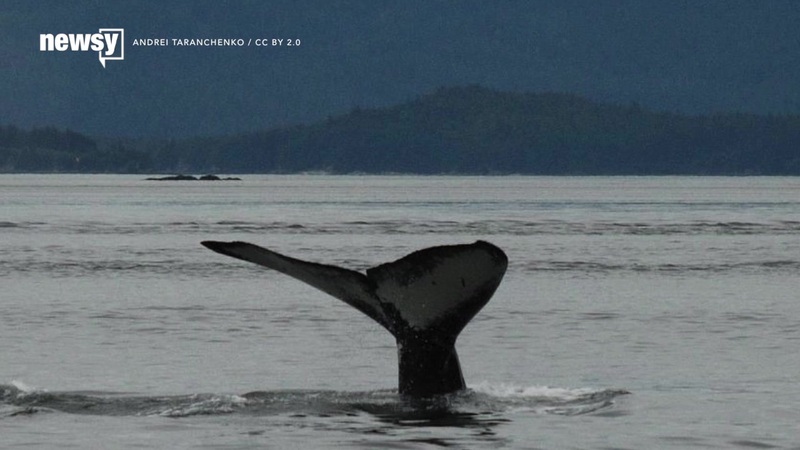 Researchers are trying to figure out exactly why whales do this because they obviously aren't using their tails to sail around the ocean. A resource protection specialist told The Huffington Post the whales could be cooling off, feeding their calves or getting some rest. Inscribed on the UNESCO World Heritage list in 1978 and situated in the Pacific Ocean some 1,000 km from the South American continent, these 19 islands and the surrounding marine reserve are referred to as a unique ‘living museum and showcase of evolution’. Located at the confluence of three ocean currents, the Galápagos are a ‘melting pot’ of marine species, this dive features the playful Galapagos sea lions by Isla Campion (Champion Island). Raja Ampat is Indonesia’s most easterly province and has earned its reputation as the world epicentre of marine biodiversity. At Cape Kri the tremendous amount of fish life is dominated by dogtooth tuna, giant trevallies, and chevron barracuda. The coral growth here is equally fantastic, with numerous hard and soft varieties. The whole 2 million square kilometre exclusive economic zone of the Cook Islands is a designated whale sanctuary. During May and October every year the Humpback Whales arrive in the Cook Islands. They are migrating north to South Pacific waters from their summer feeding grounds of Australia, New Zealand, and the cool Antarctic Ocean. They use these warmer waters to mate, give birth and to rest. The USAT Liberty was a 120m long ex-American cargo ship which now rests just off a rocky Tulamben beach in the northeast of Bali. The Liberty was torpedoed by a Japanese sub in the Lombok Strait in 1942 but wasn't sunk, it made it to Tulamben where it remained beached until 1963. When Mt Agung erupted in 1963 the associated earth tremours pushed the vessel out into the sea where it rests today. The coral covered wreck is one of Bali's most popular dives and it provides habitat for all manner of marine creatures. American Samoa is a string of seven remote islands in the South Pacific, 2,500 miles south of Hawaii. There are extensive coral reefs here, rich in marine life. This virtual dive, within the National Park of American Samoa, starts as a half-in / half-out and then dives underwater for a virtual tour of the reef. Shelley Beach is a protected marine area (part of Cabbage Tree Bay) which was declared a "No Take" Aquatic Reserve in 2002. Since being listed as a protected area local scuba divers and snorklers say they are seeing an increase in marine creatures here - a great observation. This sheltered reef near the island of Mayreau is in the Tobago Cay Marine Park (TCMP). The park was established in 1997 to preserve the reefs that serve as a foraging ground and refuge for reef fish and juvenile turtles. The reef here is unique because it grows along an underwater hot spring. The Yongala Shipwreck is a 110m former steel passenger and freight steamer which sank in 1911 during a tropical cyclone with 124 passengers onboard. The wreck lies at a depth of 33 metres and is constantly included on 'top 10 lists' for best dives in the world. The site has a strong current running over it which attracts a lot of marine life. Spinner Dolphins are small dolphins famous for their spinning, acrobatic aerial displays. During the day these creatures rest in the shallow bays of Fernando de Noronha and then move into deeper waters around dusk to hunt. The Devil's Crown is located off the northeast shore of Floreana Island, Galapagos. The Mary Celeste was a paddle steamer which sunk in 1864 after being used to run ammunitions and supplies to the Confederate forces during the American Civil War. The wreck sits in 55 feet of water and one of the huge paddle wheels is still clearly visible at the dive site. On this virtual dive you can find a discarded boat which has sunk to the sand on the ocean floor. Over time marine larvae could potentially drift over from nearby reefs and eventually settle on the boat, turning this ocean pollution into an artifical reef. Fernando de noronha has many blow holes like this one called "The Devils hole". When the tide is right, the blow hole releases air from the roof of a sub-surface cavernin a dramatic, explosive display. You can see the blow hole errupting in this virtual dive. Pedras Secas is one of the iconic dive sites of Fernando de Noronha. It's an impressive dive site that attracts a lot of marine life. The volcanic rocks provide an arena-like formation that is surrounded by passages, holes, caverns, an iconic main arch and a 60 foot 'swim through' tunnel. The southern-most breaking reef in Bermuda is not a coral or rock formation but made from fossilized prehistoric worms. The structure is incredibly strong and can easily withstand the strong winter storms. The Cod Hole was one of the first ever protected sites on the Great Barrier Reef thanks largely to the efforts of Ron and Valerie Taylor, who in the early 1980's witnessed the huge cod population decimated by overfishing. This reef attracts a large variety of marine life aside from the resident Potato Cods, including big Coral Trout, all varieties of shark, Minke Whales, dolphins and thousands of coral reef fish. See what else you can spot in this virtual dive on this truly world class dive site. Botany Bay was the site of Captain James Cook's first landing of the HMS Endeavour on the continent of Australia in 1770. They called the site "Stingray Bay" originally as the area was so full of the creatures. Bare Island is found on the northern edge of Botany Bay - while you won't find any stingrays on this virtual dive you might be able to spot a tiny, bright nudibranch. Whale sharks, the world's largest living species of fish, can be found in the waters that surround Isla Contoy throughout the Mexican wet season (June - September). These huge sharks are incredibly docile and harmless, they congregate in the area to feed on plankton that blooms at this time of year. Conception Island has historical significance as one of the first landfalls of Columbus in the New World. The uninhabited island is located on a platform that rises out of the deep ocean 15 miles east of Santa Maria, Long Island. Under the water, there is an abundance of healthy coral and marine life. Roche Saint Nicholas lies at the feet of the iconic Oceanographic Museum of Monaco. The museum was established by Prince Albert I in 1910 and later managed by the most famous underwater explorer of them all, Jacques Yves Cousteau. In 2009 Jason deCaires Taylor began placing his pH neutral sculptures onto the seafloor of Isla Mujeres and Cancun which is now known as the Cancun Underwater Museum. Found on the outer edge of Meemu Atoll, this large channel attracts an abundance of fish, including Oriental Sweetlips, Clown Triggerfish, and Longfin Bannerfish. The north section of Muli is a breeding ground for turtles, which can often be seen cruising in the current. The Florida International University manages the Aquarius Reefbase which is a fantastic underwater habitat utilized by marine biologists and astronauts for research and training purposes. In August 2014 the Catlin Seaview Survey team visited Aquarius whilst surveying the reefs around the Florida Keys. Anguilla is a small island nation in the Caribbean Sea, 10 miles north of Saint Martin. The Shoal Bay Harbour Reef System is one of seven marine parks in the country. Take a virtual dive amongst the numerous sea fans. On the UNESCO World Heritage list since 1981 the Great Barrier Reef is an icon of the natural world. The area contains the world’s largest collection of coral reefs, with 400 types of coral, 1,500 species of fish and 4,000 types of mollusc. It also holds great scientific interest as the habitat of threatened species such as the dugong (‘sea cow’) and the large green turtle. This collection focuses on the reef around Heron Island, walk in from the shore, explore the reef and keep an eye out for some green turtles. Dwarf Minke Whales travel through the Great Barrier Reef each winter where specialist dive operators and researchers wait to meet them. In 2014 the Catlin Seaview Survey team joined a Mike Ball expedition to track the whales. Wilson Island is an important turtle and bird rookery fringed by a white coral beach and covered with pisonia forest. From November to March, the island is home to wedge-tailed shearwaters and green turtles; from June to September, humpback whales can be seen going to and from their winter feeding grounds. "A lot of times, they pick a protected area, shallow with good visibility, so they can sit there, so to speak, and watch over junior while conserving energy," researcher Ed Lyman said. Whatever the reason, the whale captured on film reportedly was tail-sailing for at least 10 minutes.